"The Bar," an extension of Olympia Pizza that recently opened in the old Sonic Boom space next door, adds another good choice to a great little bar strip that includes Liberty and 22 Doors just a few steps away. 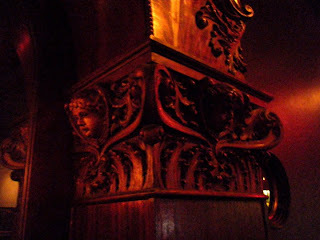 In addition to some pretty good cocktails, The Bar features the beautiful, old, Austrian Mahogany bar from the J&M Cafe, sure to be one of the oldest (physical) bars in Seattle (shipped to U.S. in the 1890s). Again, you were in our neighborhood and didn't call us. We know Harry and Deidre, the owners...... Have you gone to my friends Peter and Adrianna's bar McGilvra's in Madison Park? They also own Finn McCools. Marlowe, I have not been to McGilvra's yet (and only fairly recently went to Finn MacCools -- it was one of the rare U-District bars I had not been to). The stop at The Bar was a fairly brief one before making my way to the Fun House (to see Jim Sadler and the Soul Proprietors, et. al.) Since I usually don't plan very far in advance, I'm thinking of starting to use Twitter to broadcast bar hopping plans, in case anyone wants to hop along. What do you think of that idea?